Background: Injury-induced alteration in initial physiological responses such as hypertension and heart rate (HR) has a significant effect on mortality. Research on such associations from our country-India is limited. The present study investigates the injury-induced early blood pressure (BP) and HR changes and their association with mortality. 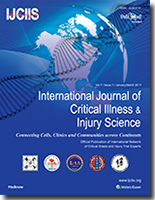 Materials and Methods: The data were selected from Towards Improved Trauma Care Outcomes collected from October 1, 2013, to July 24, 2014. Patients above 18 years of age with documented systolic BP (SBP) and HR were selected. BP was categorized into hypotension (SBP <90 mmHg), hypertension (SBP >140 mmHg), and normal (SBP 90–140 mmHg). HR was categorized into bradycardia (HR <60 beats/min [bpm]), tachycardia (HR >100 bpm), and normal (HR 60–100 bpm). These categories were compared with mortality. Results: A total of 10,200 patients were considered for the study. Mortality rate was 24%. Mortality among females was more than males. Patients with normal BP and HR had 20% of mortality. Mortality in patients with abnormal BP and HR findings was 36%. Mortality was higher among hypotension-bradycardia patients (80%) followed by hypertension-bradycardia patients (58%) and tachycardia hypotension patients (48%). Elderly patients were at higher risk of deaths with an overall mortality of 35% compared to 23% of adults. Conclusion: The study reports that initial combination of hypotension-bradycardia had higher mortality rate. Specific precautions in prehospital care should be given to trauma patients with these findings. Further prospective study in detail should be considered for exploring this abnormality. Introduction: Reduction of nonessential angiogram and embolization for patients sustaining blunt abdominal and pelvic trauma would allow improved utilization and decreased morbidity related to nontherapeutic embolization. We hypothesized that the nature of intravenous contrast extravasation (IVCE) on computed tomography (CT) would be directly related to the finding of extravasation on angiogram and need for embolization. Methods: A 5-year retrospective evaluation of trauma patients with IVCE on CT. Demographics, hemodynamics, and IVCE location and maximal dimension/volume were examined for relationship to IVCE on angiography and need for embolization. Primary complications were defined as nephropathy and acute respiratory distress syndrome. Results: A total of 128 patients were identified with IVCE on CT. Ninety-seven (75.8%) also had IVCE identified on angiography requiring some form of embolization. The size of IVCE on CT was not related to IVCE on angiogram (P = 0.69). Location of IVCE was related to need for embolization, with spleen embolization (85.4%) being much more frequent than liver (51.5%, P = 0.006). Complication rate was 8.7% in all patients, and was not different between patients undergoing embolization and those who did not (P = 0.40). Conclusion: IVCE volume was not predictive of continued bleeding and need for embolization. 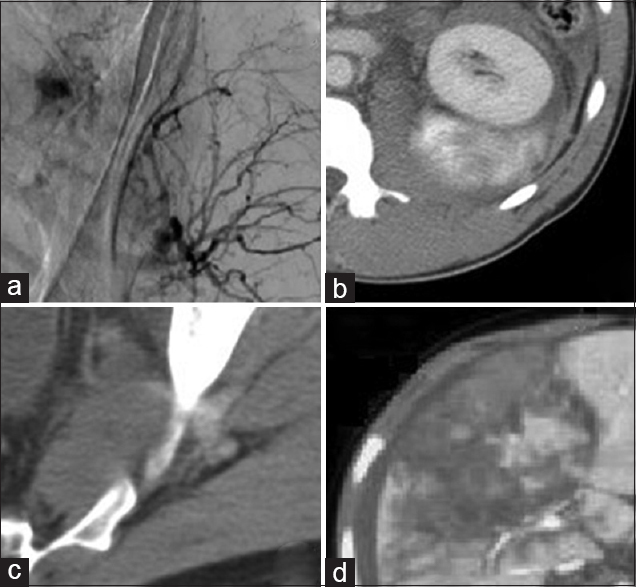 However, splenic injuries with IVCE required embolization more frequently. In contrast, liver injuries were found to have infrequent on-going IVCE on angiography. Complications associated with angiogram with or without embolization are infrequent, and CT findings may not be predictive of ongoing bleeding. We do not recommend selective exclusion of patients from angiographic evaluation when a blush is present. Introduction: Advanced age has been traditionally associated with worse traumatic brain injury (TBI) outcomes. Although prompt neurosurgical intervention (NSI, craniotomy or craniectomy) may be life-saving in the older trauma patient, it does not guarantee survival and/or return to preinjury functional status. The aim of this study was to determine whether a simple score, based entirely on the initial cranial computed tomography (CCT) is predictive of the need for NSI and key outcome measures (e.g., morbidity and mortality) in the older (age 45+ years) TBI patient subset. We hypothesized that increasing number of categorical CCT findings is independently associated with NSI, morbidity, and mortality in older patients with severe TBI. Methods: After IRB approval, a retrospective study of patients 45 years and older was performed using our Regional Level 1 Trauma Center registry data between June 2003 and December 2013. Collected variables included patient demographics, Injury Severity Score (ISS), Abbreviated Injury Scale Head (AISh), brain injury characteristics on CCT, Glasgow Coma Scale (GCS), Intensive Care Unit (ICU) and hospital length of stay (LOS), all-cause morbidity and mortality, functional independence scores, as well as discharge disposition. A novel CCT scoring tool (CCTST, scored from 1 to 8+) was devised, with one point given for each of the following findings: subdural hematoma, epidural hematoma, subarachnoid blood, intraventricular blood, cerebral contusion/intraparenchymal blood, skull fracture, pneumocephalus, brain edema/herniation, midline shift, and external (skin/face) trauma. Descriptive statistics and univariate analyses were conducted with 30-day mortality, in-hospital morbidity, and need for NSI as primary end-points. Secondary end-points included the length of stay in the ICU (ICULOS), step-down unit (SDLOS), and the hospital (HLOS) as well as patient functional outcomes, and postdischarge destination. Factors associated with the need for NSI were determined using matched NSI (n = 310) and non-NSI (n = 310) groups. All other analyses examined the combined patient sample (n = 620). Variables achieving a significance level of P < 0.20 were included in the logistic regression. Receiver operating characteristic curves, with corresponding area under the curve (AUC) determinations, were also analyzed. Statistical significance was set at α = 0.05. Data are presented as percentages, mean ± standard deviation, or adjusted odds ratios (AORs) with 95% confidence intervals (95% CIs). Results: A total of 620 patients were analyzed, including 310 patients who underwent NSI and 310 age- and ISS-matched non-NSI controls. Average patient age was 72.8 ± 13.4 years (64.1% male, 99% blunt trauma, mean ISS 25.1 ± 8.68, and mean AISh/GCS of 4.63/10.9). CCTST was the only variable independently associated with NSI (AOR 1.23, 95% CI 1.06–1.42) and was inversely proportional to initial GCS and functional outcome scores on discharge. Increasing CCTST was associated with greater mortality, morbidity, HLOS, SDLOS, ICULOS, and ventilator days. On multivariate analysis, factors independently associated with mortality included AISh (AOR 2.70, 95% CI 1.21–6.00), initial GCS (AOR 1.14, 1.07–1.22), and CCTST (AOR 1.31, 1.09–1.58). Variables independently associated with in-hospital morbidity included CCTST (AOR 1.16, 1.02–1.34), GCS (AOR 1.05, 1.01–1.09), and NSI (AOR 2.62, 1.69–4.06). Multivariate models incorporating factors independently associated with each respective outcome displayed good overall predictive characteristics for mortality (AUC 0.787) and in-hospital morbidity (AUC 0.651). Finally, modified CCTST demonstrated good overall predictive ability for NSI (AUC 0.755). Conclusion: This study found that the number of discrete findings on CCT is independently associated with major TBI outcome measures, including 30-day mortality, in-hospital morbidity, and NSI. Of note, multivariate models with best predictive characteristics incorporate both CCTST and GCS. CCTST is easy to calculate, and this preliminary investigation of its predictive utility in older patients with TBI warrants further validation, focusing on exploring prognostic synergies between CCTST, GCS, and AISh. If independently confirmed to be predictive of clinical outcomes and the need for NSI, the approach described herein could lead to a shift in both operative and nonoperative management of patients with TBI. Integrated, multidisciplinary team approach to the multiply injured patient can help optimize care, minimize morbidity, and reduce mortality. It also provides a framework for accelerated postinjury rehabilitation course. The characteristics and potential benefits of this approach, including team dynamics and interactions, are discussed in this brief review. Emphasis is placed on synergies provided by specialty teams working together in the framework of care coordination, timing of surgical and nonsurgical interventions, and injury/physiologic considerations. Republished with permission from: Bach JA, Leskovan JJ, Scharschmidt T, Boulger C, Papadimos TJ, Russell S, Bahner DP, Stawicki SPA. Multidisciplinary approach to multi-trauma patient with orthopedic injuries: the right team at the right time. OPUS 12 Scientist 2012;6(1):6-10. Nonoperative management of both blunt and penetrating injuries can be challenging. During the past three decades, there has been a major shift from operative to increasingly nonoperative management of traumatic injuries. Greater reliance on nonoperative, or “conservative” management of abdominal solid organ injuries is facilitated by the various sophisticated and highly accurate noninvasive imaging modalities at the trauma surgeon's disposal. This review discusses selected topics in nonoperative management of both blunt and penetrating trauma. Potential complications and pitfalls of nonoperative management are discussed. Adjunctive interventional therapies used in treatment of nonoperative management-related complications are also discussed. Republished with permission from: Stawicki SPA. Trends in nonoperative management of traumatic injuries – A synopsis. OPUS 12 Scientist 2007;1(1):19-35. Although traumatic pneumocephalus is not uncommon, it rarely evolves into tension pneumocephalus (TP). Characterized by the presence of increasing amounts of intracranial air and concurrent appearance or worsening neurological symptoms, TP can be devastating if not recognized and treated promptly. 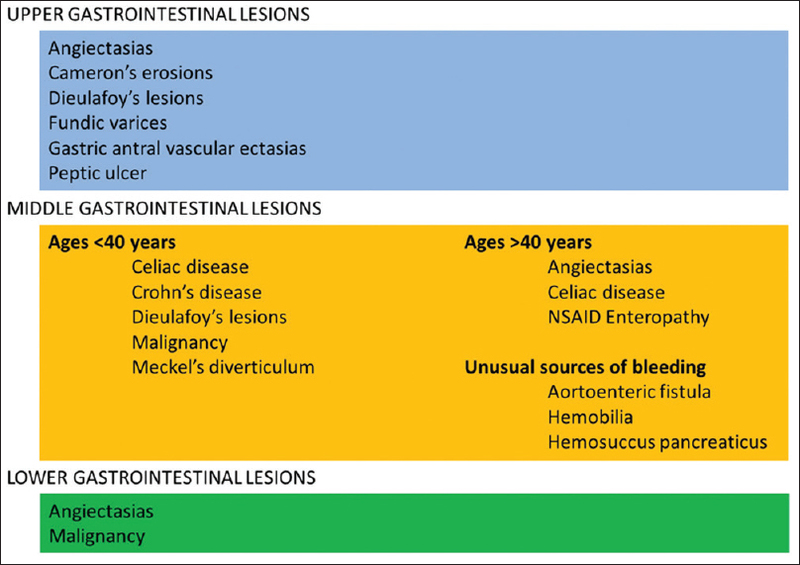 We present two cases of traumatic TP and a concise review of literature on this topic. Two cases of traumatic TP are presented. In addition, a literature search revealed 20 additional cases, of which 18 had sufficient information for inclusion. Literature cases were combined with the 2 reported cases and analyzed for demographics, mechanism of injury, symptoms, time to presentation (acute <72 h; delayed >72 h), diagnostic/treatment modalities, and outcomes. Twenty cases were analyzed (17 males, 3 females, median age 26, range 8–92 years). Presentation was acute in 13/20 and delayed in 7/20 patients. Injury mechanisms included motor vehicle collisions (6/20), assault/blunt trauma to the craniofacial area (5), falls (4), and motorcycle/bicycle crashes (3). Common presentations included depressed mental status (10/20), cerebrospinal fluid rhinorrhea (9), headache (8), and loss of consciousness (6). Computed tomography (CT) was utilized in 19/20 patients. Common underlying injuries were frontal bone/sinus fracture (9/20) and ethmoid fracture (5). 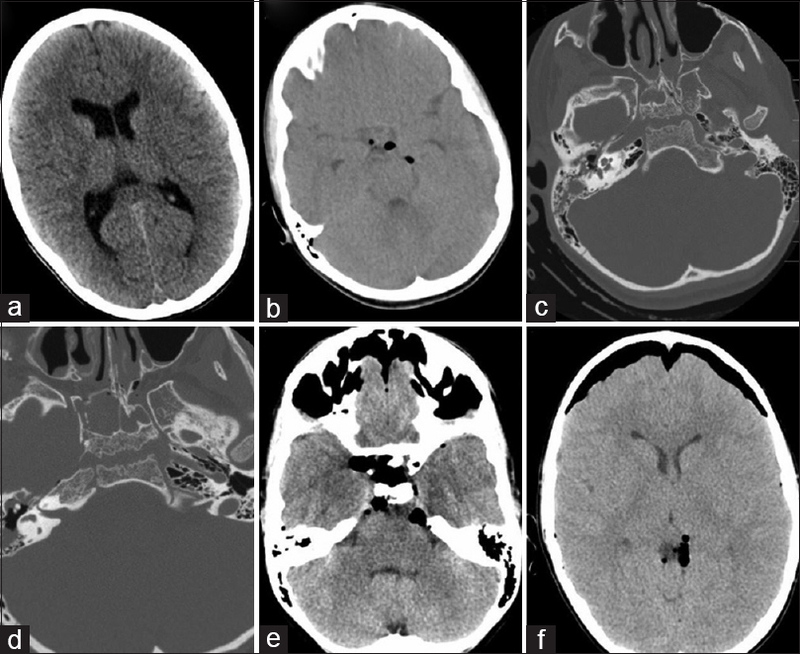 Intracranial hemorrhage was seen in 5/20 patients and brain contusions in 4/20 patients. Nonoperative management was utilized in 6/20 patients. Procedural approaches included craniotomy (11/20), emergency burr hole (4), endoscopy (2), and ventriculostomy (2). Most patients responded to initial treatment (19/20). One early and one delayed death were reported. Traumatic TP is rare, tends to be associated with severe craniofacial injuries, and can occur following both blunt and penetrating injury. Early recognition and high index of clinical suspicion are important. Appropriate treatment results in improvement in vast majority of cases. CT scan is the diagnostic modality of choice for TP. Republished with permission from: Pillai P, Sharma R, MacKenzie L, Reilly EF, Beery II PR, Papadimos TJ, Stawicki SPA. 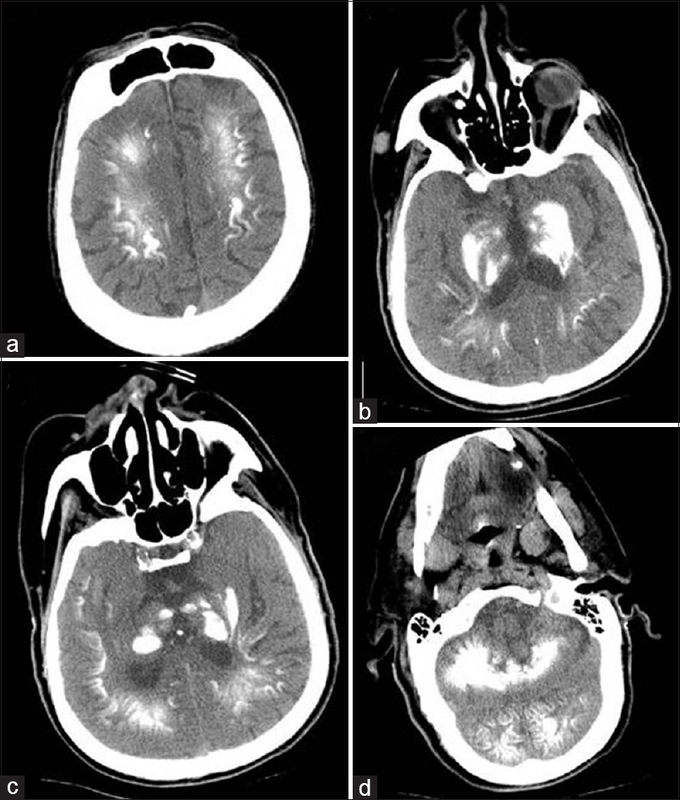 Traumatic tension pneumocephalus: Two cases and comprehensive review of literature. OPUS 12 Scientist 2010;4(1):6-11. Our first case is an 84-year-old female diagnosed with sick sinus syndrome. She underwent implantation of dual chamber permanent pacemaker without complications. On the 8th day status-postimplantation, she returned to the emergency department (ED) with moderately severe left anterior chest pain and significant ecchymosis. She was given an initial diagnosis of shingles and discharged. Two days later, she returned to the ED with increasing chest pain, dyspnea, nausea, and vomiting. 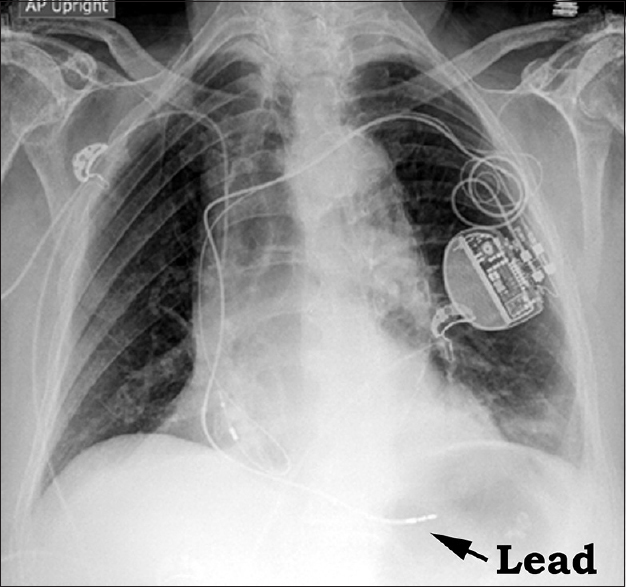 Lead migration and cardiac perforation was confirmed by chest X-ray and computed tomography (CT), respectively. She was taken to the operating room (OR) for lead repositioning, and she was discharged the next day. Our second case is a 64-year-old female with a diagnosis of 2:1 high-grade third-degree atrioventricular block. A dual chamber permanent pacemaker system was implanted without initial complication. Five days after implantation, she presented to the ED following an episode of syncope due to hypotension (67/46), shortness of breath, left flank pain, and fatigue. The initial diagnosis was sepsis. 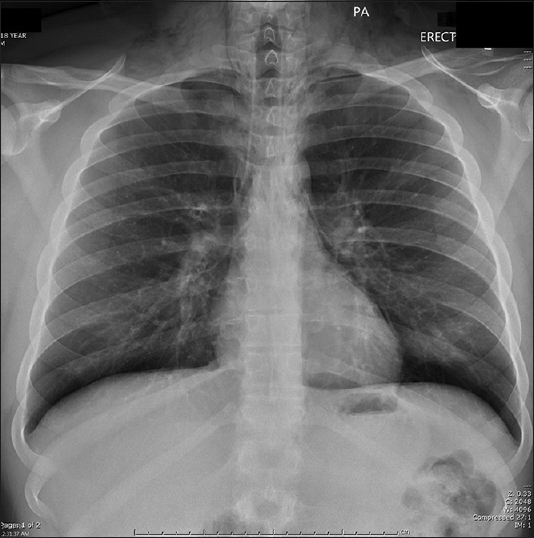 A chest CT was obtained, noting lead perforation and hemothorax. The patient was taken to the OR for lead repositioning. Olanzapine is an atypical antipsychotic drug that is being increasingly used as an intentional overdose. It usually presents with reduced and fluctuating level of consciousness and coma. It may rarely present with muscle toxicity by binding to HT2A receptor in skeletal muscle and increasing its permeability. 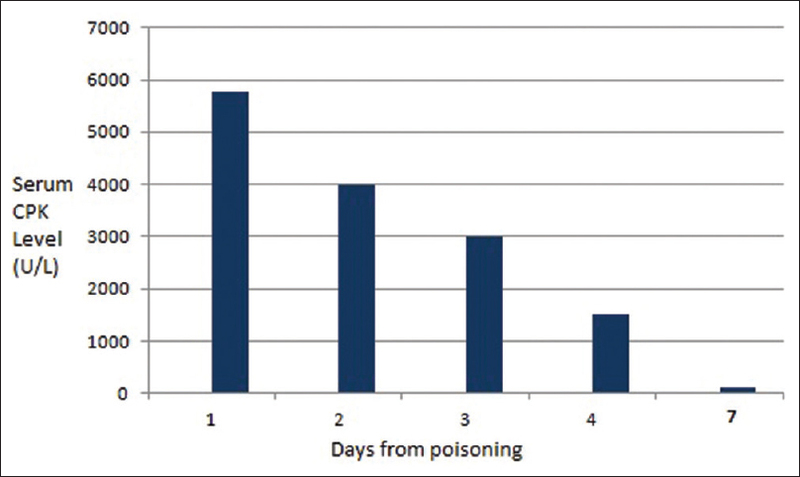 We report a case of such poisoning which had no obvious symptoms but was brought to emergency due to overdose and was found to have acute muscle toxicity as evidenced by raised creatine phosphokinase (CPK) levels. From this, we also want to emphasize that CPK levels should be checked in all the patient's prescribed olanzapine to look for muscle toxicity.